The concepts of Murray Bowen, one of the founders of family therapy and the originator of family systems theory, are brought together here in an integrative fashion. 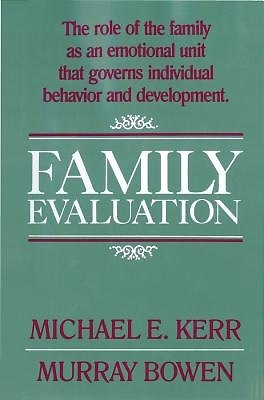 Michael Kerr (who worked with Bowen for many years) and Bowen propose that the enormously complex task of evaluating a clinical family can be orderly when it is grounded in family systems theory.Using family diagrams and case studies, the book is devoted to an elegant explication of Bowen theory, which analyzes multigenerational family relationships and conceptualizes the family as an emotional unit or as a network of interlocking relationships, not only among the family members, but also among biological, psychological, and sociological processes. Bowen's persistent inquiry and devotion to family observation, in spite of obstacles and frustrations, have resulted in a theory that has radically changed our ways of looking at all behavior.